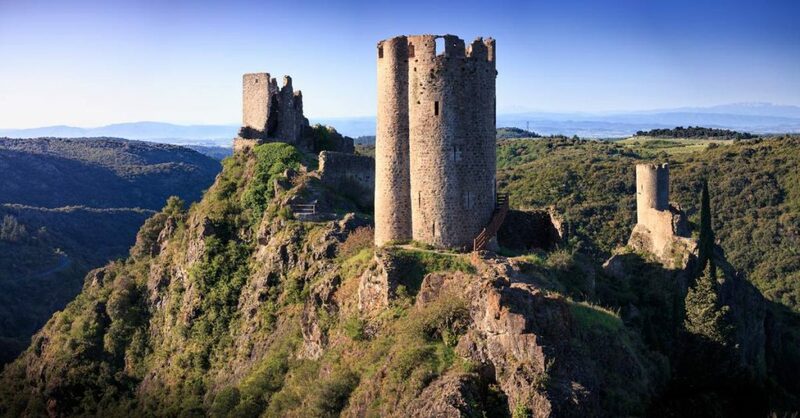 Just 40 mins south of Mazamet, you can discover one of the most impressive of the cathar ruins, Les Quatre Chateaux de Lastours – as the name suggests, the site of four former medieval castles. Dating to 1603 (the site itself having bronze-age origins of a settlement dating to 585), Lastours sits at 300 metres above sea level and was an important strategic commune in medieval times. In 2018, the original pathway leading up to the chateaux was reinstated so that visitors can explore from the perspective of those that would have inhabited the commune all those centuries ago. Discover the ruins of the former buildings, including the “Trou de la Cite” – part of the tunnel that, reputedly, ran all the way to Carcassonne in medieval times; the ancient stables, mines and, not forgetting the stunning vistas of the Carcassonne plains with the snow-capped Pyrenees in the distance. For a completely different perspective, 2km away you can visit an incredible viewpoint of Le Belvedere where, every Wendesday evening during July & August, plays host to a magical son et lumiere. Visiting Chateaux de Lastours from Mazamet takes you through the breathtaking scenery of the Montagne Noire, passing by ancient villages, deep forest gorges, waterfalls & rivers. When staying at La Villa, ask us for information about one of our Self Drive Day Tours that takes in these awe-inspiring sites. If you are interested in the history of the Cathars and exploring more of the 21 sites across our region, a great website is Pays Cathare – and don’t forget, Mazamet has the Museum of Catharisme Furthermore, the medieval village of Hautpoul, dating as far back as 413 is just a short distance from Mazamet and a great starting point for your cathar exploration where you can also walk across Mazamet’s new sky bridge, La Passerelle.